I launched Theme of the Crop almost three years ago on a wing and a prayer. After a couple of months working on my first commercial theme, I spent two days throwing together a website to see if I had any chance of succeeding. Could I sell a theme on my own website? I wasn’t sure. It turns out the answer is yes. And after three years I’m proud to say that Theme of the Crop is going strong. It could use more themes. I am bursting with ideas for new addons and features. But over the years it’s flourished and evolved into a powerful suite of plugins and themes for building great restaurant websites. While my products evolved and my business matured, my website languished. It was still the same thing I threw together in a hurry years ago. I’m excited to finally unveil my new website. It’s a fresh look for my themes and plugins, with important changes to what I’m selling and how I aim to help you build better restaurant websites. What does it mean to build better restaurant websites? The theming landscape for WordPress is full of all-in-one products, mega-themes which promise you a limitless pallet of design choices to build a website with any look. They offer an extraordinary level of control over the look and layout of your website. At Theme of the Crop I’ve taken a different approach. I’ve seen the kinds of websites these all-in-one themes create. Sometimes they look great. Sometimes they don’t. But they never lead to great restaurant websites. That’s because restaurants have their own set of problems. They’re more than just a generic website with stock images of food and foodies. Successful restaurant websites have unique marketing, workflow and SEO problems that need to be addressed. Over the years I’ve developed a suite of products that address these needs. But I’ve done a terrible job of communicating that to you, my customers. That’s why my new site puts this question at the center of everything: what does it mean to build a better restaurant website? I’ve revamped my sales pages so that I can tell you why I think my products stand out from the crowd. What’s the special recipe I use when baking my themes? How can my online reservations platform make your life easier? How can you more easily manage mobile-friendly menus? And SEO? I’ve got it covered where it really matters for restaurants. From top to bottom, I’ve revamped my site to deliver one message: I’m more than a theme shop. 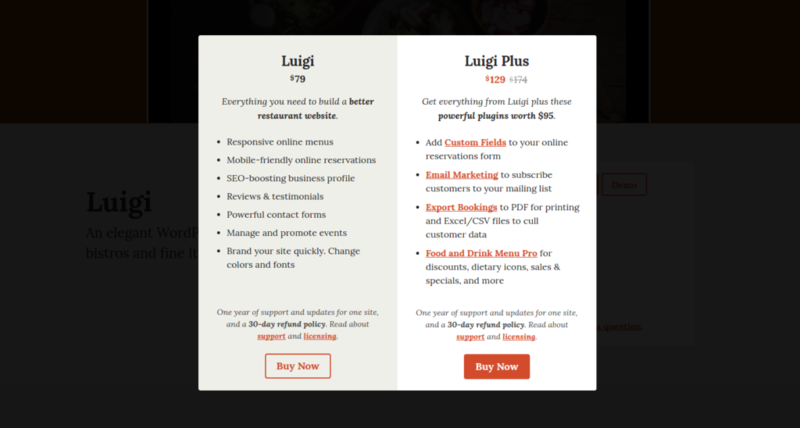 My plugins and themes address a broader range of restaurant needs. As part of this new emphasis on the way my plugins and themes work best together, I’m introducing two new product bundles. These bundles allow you to get access to a larger package of themes and plugins at discounted rates. When purchasing a theme, you can now choose between buying just the theme or buying what I’m calling the Plus package. Plus provides you with all of my commercial plugin addons alongside the theme at a savings of $45. That means you can immediately take advantage of mailing list subscription automation, custom booking fields, menu discounts and specials, dietary icons and more, without buying these great features one-by-one. I’m also offering a special Restaurant Reservations bundle at $49. This provides you with every addon for the popular online bookings plugin at a savings of $21. When I launched my latest theme, Luigi, I set the price at $79. That’s now the base price for all of my themes. And the Plus bundle I’ve introduced for all themes is $129. I know my prices are higher than what you’ll find at other shops. I believe I offer better products and better services than they do. But there are two big reasons I’ve worked towards this new pricing. First, higher prices allow me to spend more time with my customers. I get fewer sales, but each customer is worth more to me. That means that when you have an issue, or you need help tweaking your theme, I’m able to take more time out of my day to help you. My customers are not just churn to me. And raising the price on my themes helps me ensure that I can meet that commitment. Second, higher prices allow me to invest more in the long-term development of my products. I’ll admit, I’m not a great marketer and I don’t make a ton of sales. Setting a higher price point for my products ensures that my focus stays on building and maintaining a great suite of plugins and themes. Higher prices are never easy to swallow, but they do result in better products, as I demonstrated with my recent major update to themes that are more than two years old. So here it is: the new Theme of the Crop. This has been in the works for months. But it’s been on my mind for years. I hope you like it as much as I do. However you feel about it, I’d love to get your feedback. Let me know what you think about the new design, the product bundles or the pricing changes.